An infusion (of water, decaffeinated black tea, rooibos, black pepper, cardamom, cinnamon, ginger, cloves, chicory, natural flavors, star anise), cane sugar, honey, ginger juice, natural flavors, vanilla extract, citric acid. 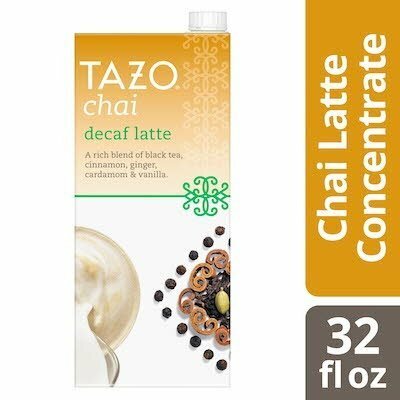 Guests and employees will love this Decaf Chai Latte concentrate. Tazo is all about the unexpected and our blends are no exception. This tea concentrate blend is the chai flavor guests love without the caffeine. Our blend includes a fully oxidized decaffeinated black tea blend that brings out rich, bright flavors; a Rooibos which is a spicy and floral red tea with a kiss of natural sweetness; Cardamom is Intensely aromatic and adds a dash of heat; and Cinnamon adds warmth and spice nestled into a toasty aroma. Easy-to-use concentrates create delicious latte beverages as easy as 1, 2, 3 with a simple shake, pour and blend. Add ice for iced lattes and heat milk for a hot latte variation. Before Opening: Check the "best before" date on top of the carton. Preparation: Shake the carton and mix one part of concentrate with one part water, milk or non-dairy milk. Serve individual beverages hot or over ice.